The Storrs-Willimantic Bus and Willimantic City Bus do not run on the following holidays: New Year’s Day, Memorial Day, Independence Day, Labor Day, Thanksgiving Day and Christmas Day. The Willimantic-Danielson Deviated Fixed Route and Dial-A-Ride services do not run on the following holidays: New Year’s Day, Martin Luther King Day, President’s Day, Good Friday, Memorial Day, Independence Day, Labor Day, Columbus Day, Thanksgiving Day, the day after Thanksgiving, and Christmas Day. The Willimantic-Norwich Rt. 32 Commuter Bus runs 365 days a year. Folding strollers, carts and bicycles are welcome on WRTD buses and vans. These must be folded before boarding and kept out of the aisle if possible. 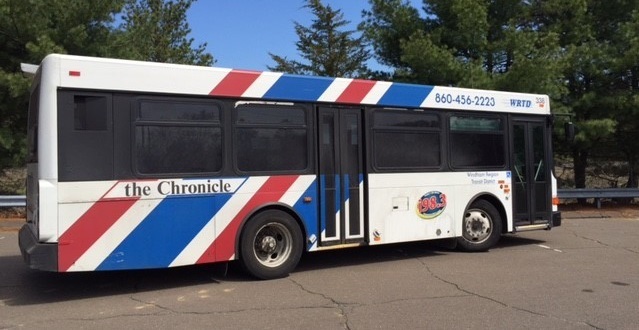 WRTD’s Willimantic City Bus and Storrs-Willimantic Bus vehicles are equipped with bicycle racks for customers on a first-come, first-served basis. Non-motorized two-wheel bicycles only. Customers use bicycle racks at their own risk and are responsible for loading and unloading. All WRTD buses and vans are accessible to persons with disabilities. Also, some of our buses can kneel to lower the first step height. Please ask the driver to kneel the bus to assist you in boarding or alighting. Items found on a WRTD bus or van should be turned in to the driver immediately. When an item is found on a WRTD bus or van, it is kept at the WRTD office. Items not claimed at the end of 30 days will be disposed of. If you left an item on one of WRTD’s buses of vans, contact the WRTD office during regular business hours. When you call, it would be helpful for you to provide us with a detailed description of the missing item. Please call us for bus schedule information, for lost & found items, to schedule a ride, or with your comments.